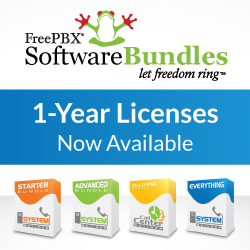 The current release, FreePBX 2.10 has been pretty much final for quite a while now though we have been reluctant to officially bless it as such because we wanted to be very conservative on the new release given the GUI changes and some of the other big changes that have gone into it. With about 6000 beta and release candidates systems that have tried it out and many of those active and in production, we decided that it’s probably ok to bless it as final! The bug rate coming in on 2.10 has been pretty minimal but a careful analysis of the bugs that come in help us determine what type of issues are still being detected, are they on the new code or bugs from prior releases, etc. The biggest area that we’ve been diligently working on is the new backup module that was provided by Schmooze Com, Inc and has added a level of flexibility and robustness that was never there before. This includes significant functionality for user defined backup templates, remote storage and warm standby “High Availability” configurations and built in intelligence that can be configured to avoid common issues such as warm backup servers accidentally “stealing” live SIP/IAX trunk registrations. We also highlighted some last minute additions in our [url=/news/2012-02-22/lots-of-recent-2-10-activity-to-close-things-up]last blog[/url] that got rolled in as a result of all the tickets being reviewed, closed, moved or acted on prior to this final release. So if you have not played with it there are a handful of exciting new additions that you may find quite useful! For those of you playing with the “new” app_confbridge in Asterisk a word of caution. Asterisk 10, which we are striving to support, decided to rewrite app_confbridge changing the syntax and overall way that it is configured. From reading through the new design we are really excited about what it may deliver on paper and as such, a lot of good ideas are being exchanged amongst the development community. You’ll probably see 2.11 come out with an all new Conferencing Module that takes much more advantage of this new and MUCH improved conferencing! (Keep in mind, this is all “on paper” as none of us developers have really played with it much, but we’ll give it the benefit of the doubt and hope it all works out as good as it is described in their wiki!) The bad news of all this, if you are running Asterisk 10 then app_confbirdge will not work for you. As it stands, app_confbridge is being considered somewhat “experimental” in FreePBX and it notes such in the tooltip where you can configure it in Advanced Settings. Given the changes in 10 and the expected rewrite of the entire module, it’s unlikely we’ll add support for the Asterisk 10 version until the new module comes out in 2.11. As a quick reminder or if you aren’t already aware, we’ve got our next [url=/open-telephony-training-seminar]OTTS training coming to Minneapolis, MN[/url] in May. There’s a $300 savings early bird special going on right now so if you’re thinking about coming go have a look because once the special is over, there’s no more deals! Attendees have already started signing up and our last two classes have filled up requiring us to turn away some late comers so if you are thinking about it now’s the time! For now, thanks for all of you who have been actively testing and providing feedback on our extended 2.10 Release Candidate! We are excited to be announcing the final release! Previous PostFreePBX 2.10 Beta – Lots of Credit to the Schmoozecom.com team!